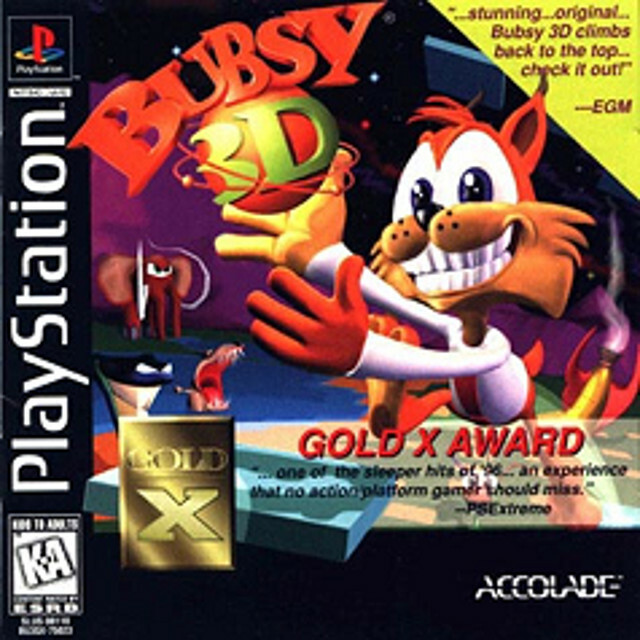 Bubsy 3D has an unfortunate reputation for being one of the worst video games of all time. While many people like to pretend the game was considered a colossal stinker right out of the gate, these people tend to forget the world was a very different place back in 1996. In 1996, Bill Clinton was elected to a second term as US President. The Chicago Bulls were unstoppable in the NBA, winning a record-smashing 72 games in the ’95-’96 season and following that up with 69 wins the ’96-’97 season. Billboard called “The Macerena (Bayside Boys Mix)” the most popular song of the year. Clearly, it was a good year for things that start with B. And sure, Bubsy wasn’t living it up like Bill or the Bulls or the mixes of the Bayside Boys, but he certainly wasn’t having the terrible year you might expect. 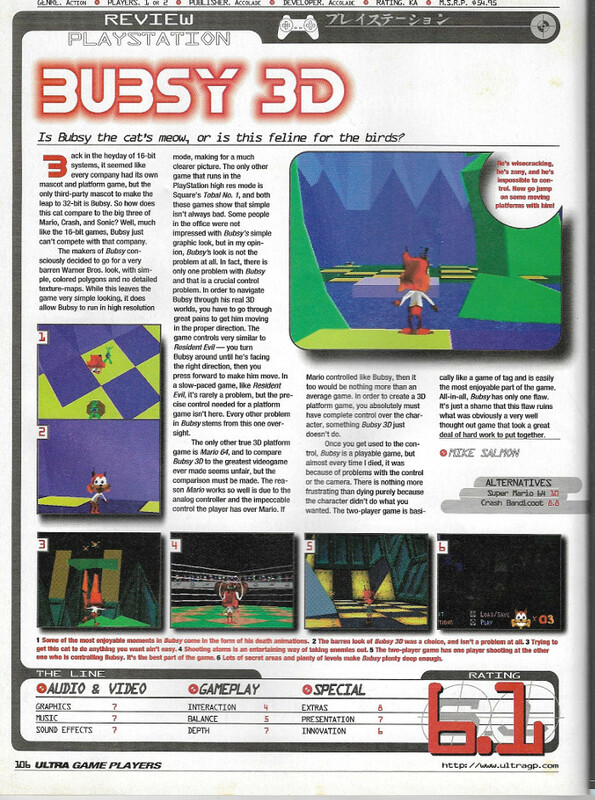 In Issue 92 (Holiday ’96) of video game magazine Ultra Game Players, Mike Salmon reviewed Bubsy 3D, giving it a 6.1 (out of a possible 10). If this review is anything to go by, life was mediocre (at worst) for the anthropomorphic bobcat. 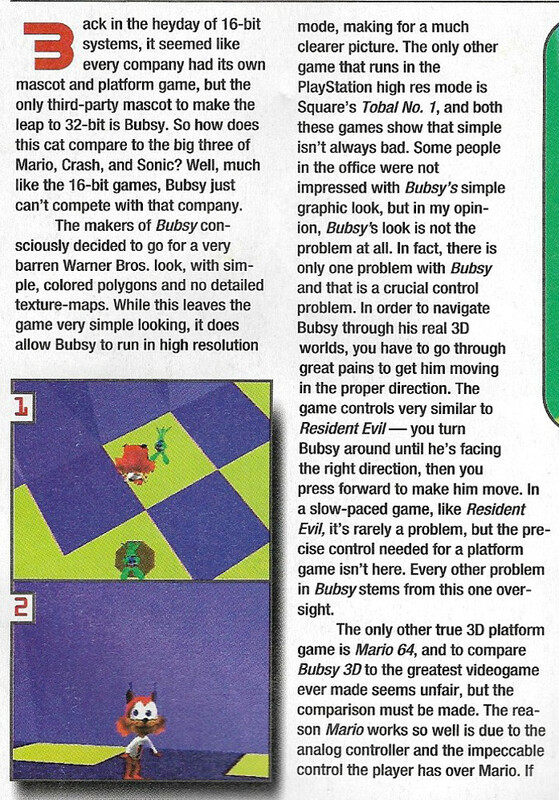 In comparison, Bubsy 3D doesn’t look great, but it certainly wasn’t the train wreck we imagine it must have been. The statement that Mario 64 was the only other “true 3D platform game”wasn’t accurate, since Crash Bandicoot came out that same year and Jumping Flash! had come out in 1995. In fact, the earliest example of a true 3D platformer we at Retrovolve have been able to find is a French game called Alpha Waves that came out in 1990. 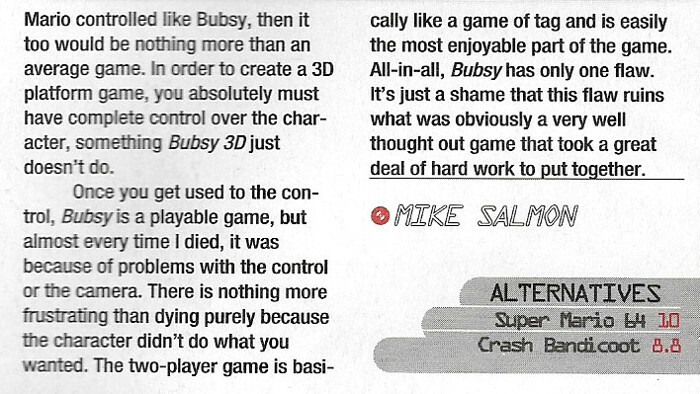 I could also challenge the claim that Mario 64 is “the greatest videogame ever made,” but this was not an uncommon opinion in 1996. Next Generation magazine made the exact same claim that year. I saw Mario , and I said, “That’s it. Back to the drawing board.” I went back and told my partner to go look at Mario and come back and talk to me about it, and he did. And I said, “We can’t ship this. We just can’t.” He said, “Accolade paid us a lot of money to develop it; what are we going to do?” I said, “We’re going to go back and we’re going to do the best that we can to make it as good a product as we can with the limits that we have.” And that’s what we did, but it was definitely a rude awakening when I saw Mario 64. This isn’t a story of a greedy, billion-dollar studio halfheartedly churning out a piece of garbage to make a buck, as many like to assume. It’s actually a heartbreaking story of a small studio with a tight budget trying to innovate a fairly uncharted genre, only to be outdone in the eleventh hour by mastermind Shigeru Miyamoto himself. It’s so easy in retrospect to point at Mario 64 and compare 1996’s game lineup to that high standard. But that’s not even close to a representative viewpoint of the games industry at the time. 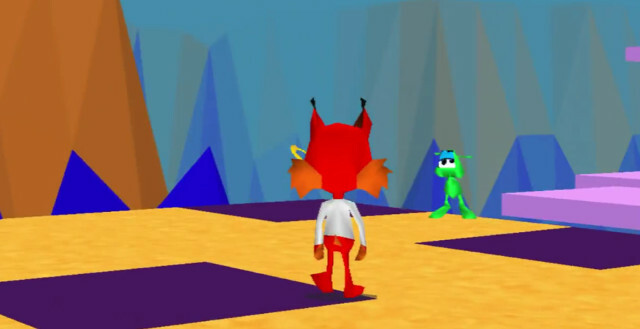 At the time, polygonal game development was pretty new, and everybody was trying to predict the future of the platformer. 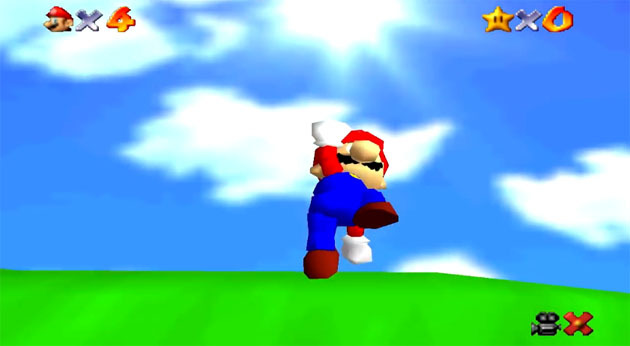 Mario 64‘s prediction, as history shows, ended up being the preferred one, but it’s simply not fair to pretend games like Jumping Flash!, Crash Bandicoot, and even Bubsy 3D didn’t make their best attempts at doing the same thing. 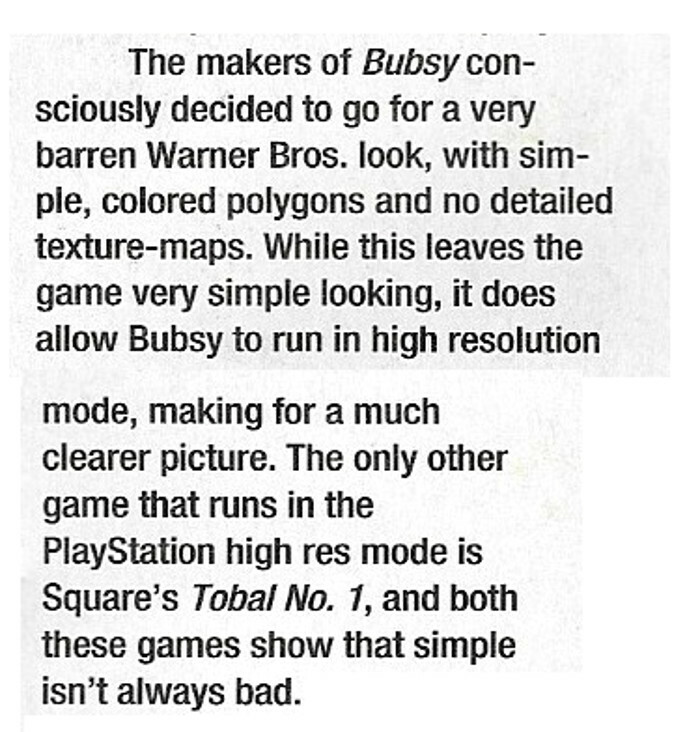 Bubsy 3D‘s biggest mistake — a mistake acknowledged over and over again by Ultra Game Players‘ review — is that the controls just didn’t cut it. And that is probably the best way to sum up exactly what went wrong with the game.